Like most people in modern western civilization, Rachel Jackson has loved puppets ever since they taught her how to read. One of her earliest memories involves throwing a tantrum over missing the Phyllis Diller episode of The Muppet Show (sorry Mom). 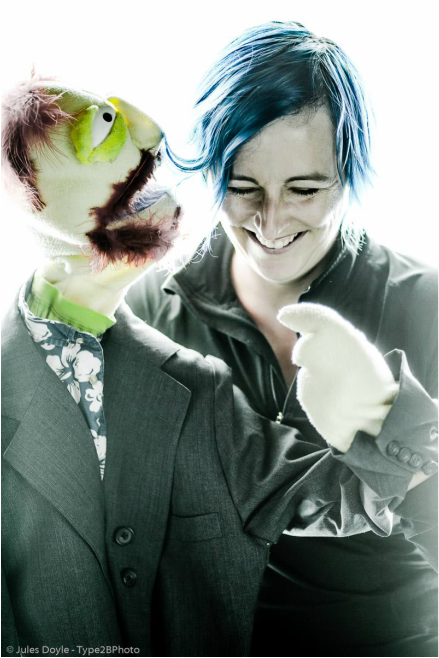 The creator of the hit puppet musical MANOS – The Hands of Felt, Rachel designs puppets and teaches puppetry workshops through Vox Fabuli Puppets. Based in Seattle, Rachel has been puppeteering on stages both local and international since 2008. Her work has been called "mad and masterful" by The Seattle Times. She has crafted puppets for the Seattle International Film Festival, webseries The Panel Jumper, Annex Theatre, Wing It Productions and Everett Community College. In 2013 she had the (HUGE) honor of studying at the Eugene O'Neill Theater Center's National Puppetry Conference, under Sesame Street's Martin P. Robinson. Rachel most recently brought her talented hands to "Stories for Bad Children: Chapter 2,” "Whedonesque Burlesque" and “Goblins and Glitter: a burlesque tribute to Labyrinth”. Rachel co-produces the Fussy Cloud Puppet Slam and is unofficial Puppeteer at Large for the Seattle Nerdlesque scene. When she's not engaged in puppet shenanigans, Rachel enjoys singing with band The Fog People, doing funny voices for web series The Scottish Ninjas and playing with KRAM Improv. In her spare time, she sleeps.